I’d always considered The Nebraska Game to be the/my standard of the/my Index of Bodily Misery While Photographing A Sports Event. Shooting The Nebraska Game at Missouri in 2009 meant four hours in 50 degrees, wind and rain. Despite my new rainjacket (which I still have) and my best efforts to stay warm and dry, I was soaked to the skin by halftime and had to peel my clothes off when I finally returned home that night. It made for good photos, but the experience wasn’t something I’d like to repeat. Hello, Saturday. Hello, snowfall. Throughout the entire game. © 2011 by The York Daily Record/Sunday News. Hot air rises among members of the Fighting Illini as they huddle on-field between plays and as Penn State defensive end Jack Crawford waits for the drive to resume in the fourth quarter on Saturday, Oct. 29, 2011, at Beaver Stadium. The Nittany Lions defeated the Fighting Illini 10-7. 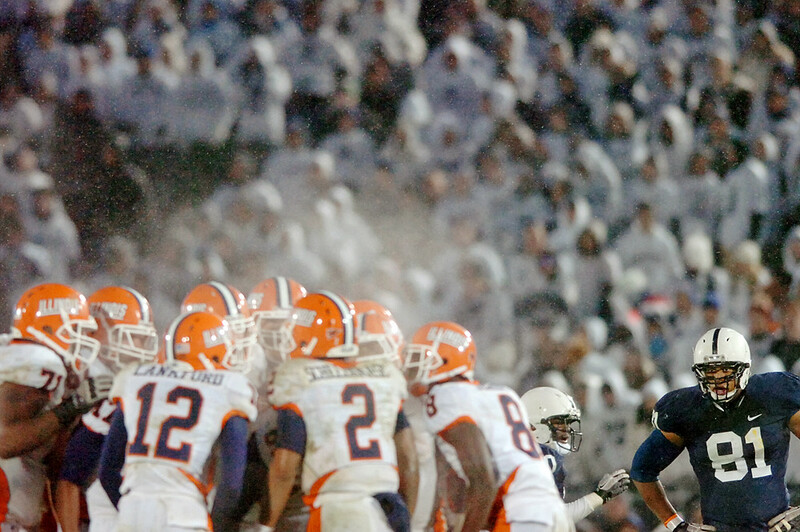 This was Penn State's first home game with measurable snowfall since Nov. 2, 1996, against Northwestern. Check out more photos (and read the overall article), too.